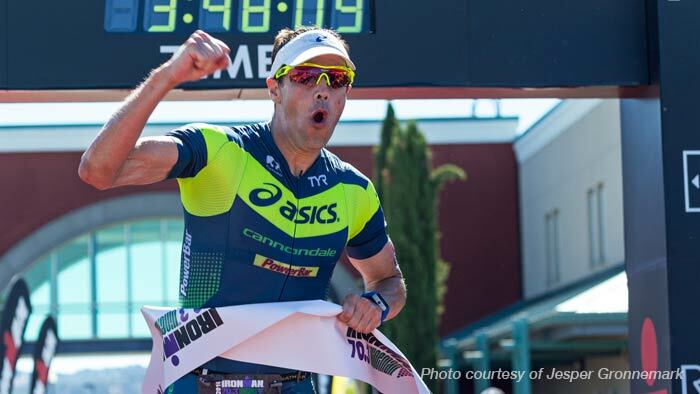 For over 10 years, American Andy Potts has had wins across many distances and formatsand continues to be one of the top triathletes in the sport. Yet, he somehow evades the spotlight and quietly goes about his training and racing. His almost constant smile belies the fact that he is a tough competitor who has succeeded at many different distances. Even when training for his biggest race of the year, the IRONMAN World Championships, Potts does not run what would be considered a traditional long run. Instead, he focuses on race specificity, pace, and mental strength. For many athletes, a long aerobic run serves as their key run of the week. However, the low miles/high pace approach means that Potts’ key run is his Saturday tempo run. Adding volume and intensity is not the norm with endurance training, but Potts and Doane have found that under certain circumstances, it is the best way for Potts to achieve his peak fitness. “Our longer runs are designed to be race specific and get maximal training benefits without sacrificing workouts for the next few days or week,” says Potts. Though it lacks the distance that many athletes cover for their long run, Potts believes it is great preparation for what he faces on race day. “This run is a great prep for IRONMAN racing as it is at the end of my week, when my legs and body are already fatigued and I have to mentally and physically focus on the goals of the workout,” he comments. “With IRONMAN racing you don’t want to think too far ahead because the task becomes too daunting. It is the same with this run- one mile at a time.” The race specific nature of this run- being off the bike, at race pace, and with a race mentality, is something that helps gives Potts an edge on race day. Based out of Colorado Springs, (altitude 6,035ft.) Potts went to higher elevations for his final Kona prep. His last tempo run in Colorado Springs was 14 miles, 10 miles at tempo averaging right at a six minute per mile pace, which Doane described as “comfortable”. The file below shows Potts’ heart rate for this key workout, including the bike, run, and his weight session afterwards. See Potts’ full Polar V800 file here. Pace is not the only concern for this run. Monitoring heart rate gives them more insight into how Potts’ body is responding to the training load. “As he gets more tired and the mileage starts piling up and his heart rate starts climbing,” says Doane. During this run, Doane rides beside Potts on a mountain bike offering fuel and encouragement. Being with Potts allows him to constantly monitor the effort. “I will ask him for his heart rate and I tell him ‘Don’t just wave me off, if you can’t tell to me, we are going too hard’. If he can talk to me than we are running at the right pace,” Doane says. Running longer and faster builds confidence for Potts and encourages him to keep pushing himself. Monitoring each workout and comparing it to the prior workouts allows him to see his improvement over time. “As I start to see faster paces at longer distances, at the same or lower heart rate levels, and equally important, at a lower perceived effort, I get the necessary feedback to keep challenging myself,” he says. So how does Potts handle the pounding of race day and keep from physically breaking down? Potts has been training consistently for triathlon for over 15 years and that accumulation of volume through smart training. “I think it’s years of training that’s accumulated and he can tap into it when necessary. He is very strong and that’s a big part of his training. He has years of smart training under his belt and we tap into it on race day,” comments Doane. Potts also has a very consistent weight program that he sticks with through the year. “He has a very strong program that he does three times a week. It varies day to day, but it’s a very sustained, progressive type of program,” says Doane. Even after his tempo run, Potts will hit the weight room for 45 minutes. Their approach to the long run may be unique, but that is what has allowed Potts to become one of the most versatile and dangerous athletes in the sport. He and his coach have stayed focused on finding what works best for him.